While there are many reasons someone could suffer a heart attack – inherited heart disease, smoking, unhealthy eating or lifestyle, high levels of stress – one thing is common: a heart attack is a terrifying experience not only for the individual who suffers it, but also for that person’s loved ones and family members. After this experience, the question becomes, “how do I get life insurance after heart attack at a fair rate?” Many people who have suffered heart attacks have a very difficult time getting coverage afterwards (at reasonable rates). Fortunately, this is not always the case and, while a heart attack will certainly impact one’s life insurance rates, it is indeed possible to get post-heart attack coverage for a good price. Post-heart attack rates are based on a number of heart attack pre-conditions, which are either classified as light, moderate, or serious. Depending on that classification, lifestyle and other health factors are taken into account when the company determines your premiums. For example, if you are a non-smoker who has suffered a heart attack, your life insurance premiums will vary. Below are examples of typical rates for non-smoking men and women. The monthly rates for men who are 35 years old can vary between ~$20 and ~$60, whereas monthly rates for men who are 50 years old can range between ~$70 and ~$200. Monthly rates for women who are 35 years old can vary between ~$20 and ~$50, whereas monthly rates for women who are 50 years old may range between ~$50 and ~$150. 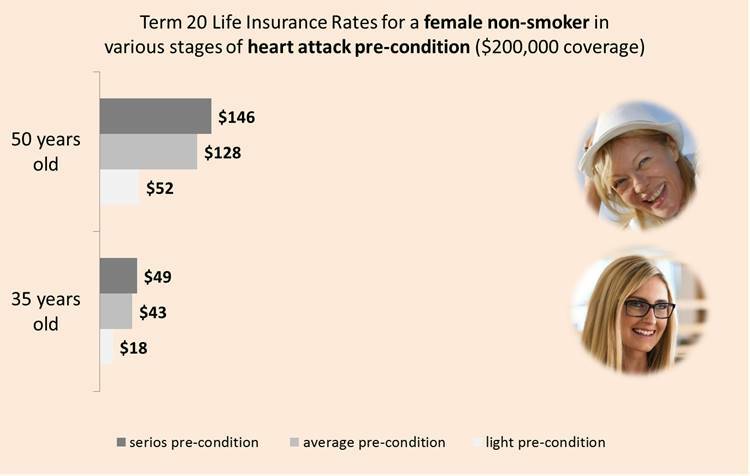 Life insurance rates for smokers will, for obvious health reasons, average higher. If you are trying to get life insurance after experiencing a heart attack, contact an experienced broker for professional advice. Timing of your last heart attack: If your heart attack was several years ago, that is good. Your rate improves as the time increases between your attack and your coverage purchase. Reasonable build: Many heart attack cases are caused by unhealthy lifestyle habits, such as eating too many fatty or sugary foods, over-drinking or smoking, sitting too much or generally leading a sedentary lifestyle. As our bodies or “build” generally reflect our lifestyle choices (especially after a certain age), appearing relatively fit and healthy will give your potential insurers more confidence in your lifestyle. Sometimes, insurers will use a Body Mass Index (BMI) chart to determine type of build and level of fitness. Non-smoker: We all know smoking increases rates of mortality and disease, and is one of the greatest contributors to heart attacks. If you smoke, you will most certainly have a harder time convincing insurance companies to provide you with good rates. 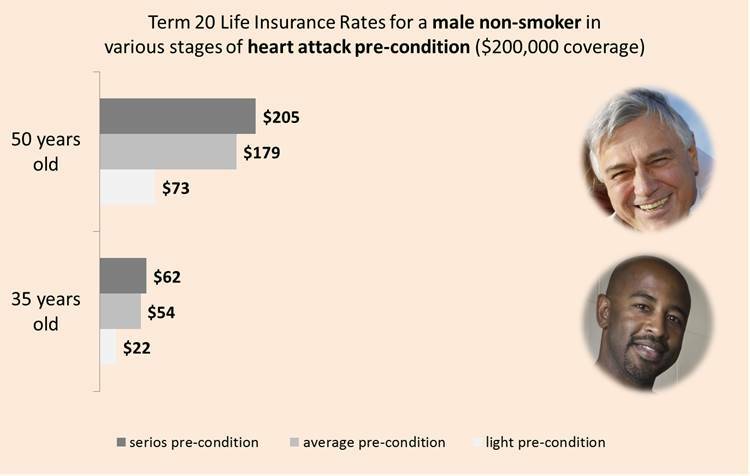 In the next part of this article, we will go over life insurance rates for smokers who have had heart attacks. Are you interested in finding out more about life insurance for people who have suffered heart attacks? You can contact an experienced insurance broker to go over your options or even those options available to a friend or loved one. 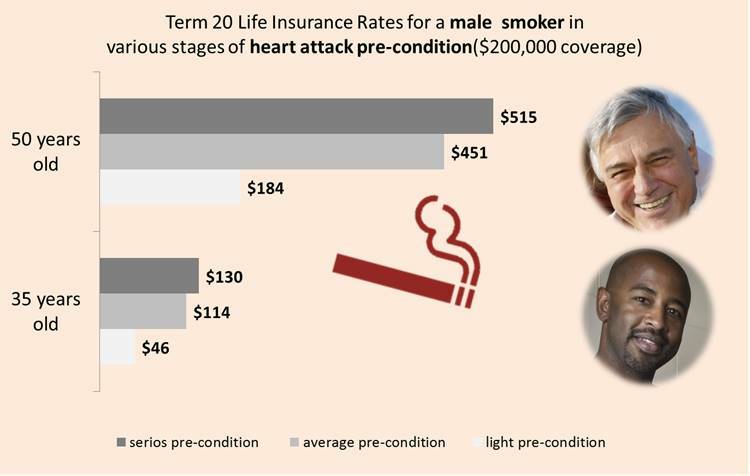 Monthly rates for male smokers who are 35 years old can range between ~$50 and ~$130; monthly rates for male smokers who are 50 years old can range between ~$180 and ~$520. 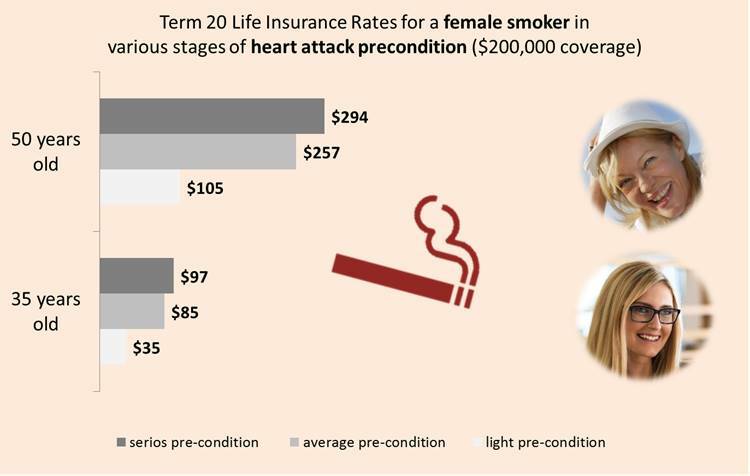 Monthly rates for female smokers who are 35 years old can range between ~$40 and ~$100; monthly rates for female smokers who are 50 years old can range between ~$110 and ~$300. 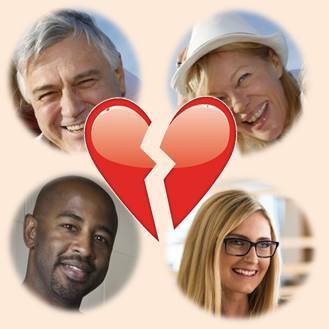 An experienced broker can help you find life insurance for good rates after a heart attack. In some cases, you may actually qualify for a traditional life insurance policy, even if you have suffered a heart attack. In cases that are much more severe, however, you may have to look at more specialized packages. This is especially true if you have suffered a very recent heart attack. That said, getting insured is not impossible. Depending on how severe your pre-condition is, there are two types of policies available to you. Guaranteed issue life insurance: Guaranteed issue life insurance is expensive, but it is, guaranteed. In other words, anyone who applies for this type of life insurance will receive it, without having to answer any questions about their medical conditions or undergo any medical examinations. While the coverage is small compared to other life insurance packages (it’s limited to $25,000) even this amount can greatly reduce financial stresses associated with treatments and mortality costs. Compared to the expenses of medical and funeral costs, paying the high premiums for guaranteed issue life insurance is typically worth it, as, in the end, it ends up costing less than not having any coverage. Simplified issue life insurance: For this kind of insurance, you are required to answer a short questionnaire, but you are not required to undergo any kind of medical tests. The coverage usually caps out around $300,000. While the premiums for simplified issue life insurance are higher than standard policies, the coverage provided still goes a long way in alleviating financial burdens associated with medical, treatment, or funeral costs. The best way to get life insurance after a heart attack is to talk to an experienced life insurance broker. He or she will help you find the best policy for your situation, and will guide you through the process. In addition, you won’t have to “shop around”; a broker will do all the research for you. Furthermore, because brokers are not beholden to a single company, they are able to give you their unbiased perspectives on the best rates and policy options available to you. The best part? Hiring a broker costs you nothing, as brokers work on commission. If you’re interested in finding out more, contact us so we can connect you with an experienced life insurance broker and get life insurance after heart attack.